An example of public sector and design approach. “I want to develop and improve public services” was my answer to the question “What are your personal objectives to study Service Innovation and Design”. “Good luck” said the teacher and her voice was full of cheer and encouragement – I think. Although the quality of public services is relatively good in Finland there is always room for improvement. It was my day #1 at Laurea University of Applied Sciences in September 2014 in Finland. The Master’s Degree Program in Service Innovation and Design (alongside a full-time job) was about to start. Twenty-six students from all over the world, full of energy and enthusiasm, were there to learn about customer focused service development and innovations. On day #2 we started our first course “Design Thinking”. So my aim was to learn how to develop and improve public services and therefore I needed to learn the basics first; Design Thinking (DT) models and DT tools. In our course we learned that there are several DT models. Tschimmel, Katja (2012, 6-10) introduces five different models. In our course we had a chance to learn more about one DT model created by Gijs van Wulfen: the FORTH innovation method. All DT models include DT tools. Tschimmel – as well as Liedtka & Ogilvie (2011) – write that there are 10 different DT tools (as you can see from the picture above). Katja Tschimmel (2012, 11) points out that one model is not supreme compared to the others; a service development team chooses the model that best suits their purposes. In all the design processes the team will anyway go through the following three phases; inspiration, ideation and implementation (Brown, 2008). 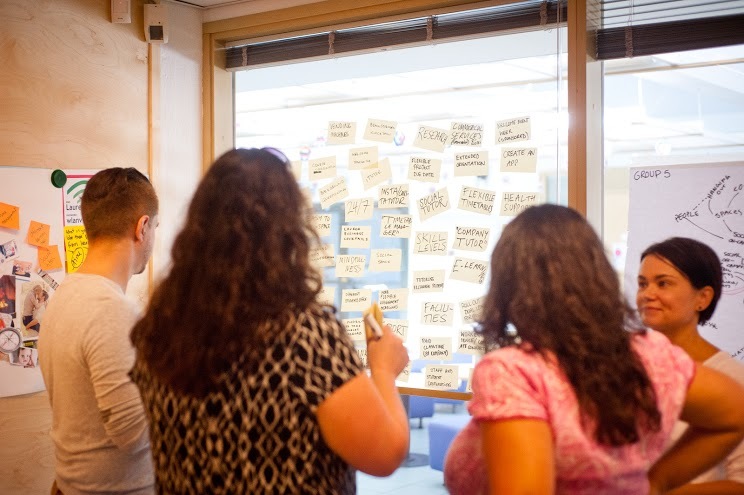 Our service development process: Raising Ideas and Brainwriting. We did our service development practice in two days. In real life DT processes take time. You cannot and shouldn’t push someone to innovate – 16-20 weeks is an average time for a good innovation process. Liedtka, Jeanne & Ogilvie, Tim 2011. 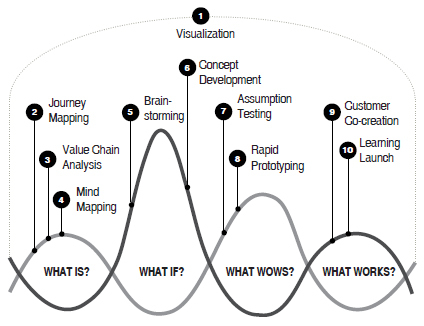 Designing for growth: a design thinking tool kit for managers, New York: Columbia University Press. I think that you chose the right place to study since your goal is to improve public services 🙂 I’m under the impression that Service Design and Design Thinking have proven to be highly successful in public service development work. Some of the first case examples of successful Service Design projects I have encountered were indeed carried out to develop public services – If I remember correctly, the United Kingdom has been a pioneer and really embraced the Service Design methods and the DT concept. I don’t have any links to the aforementioned case examples on hand, but I’ll look around a bit and link them here if I still manage to find some of the ones I’ve read (they were really interesting)! Maybe some of the other readers could also chime in with links to interesting case study reports etc? hey where are you studying, is it a master degree?